Give up? It's called Full Text Search. 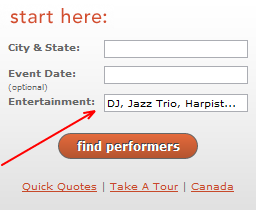 See that third text field labeled ‘Entertainment?’ The one with the big red arrow pointing to it? That’s new. It might not look like much but it makes it a lot easier for clients to find you and your fellow entertainers. No more endless scrolling or debating “ensemble or band?” Now clients can type right into this smart search box. It's some of the same technology that Google uses and it even accounts for synonyms and common typos! Just start typing and we instantly narrow down the results. We know our visitors aren't always entertainment experts and we don't expect them to know how we categorize different genres of music or types of entertainment. The full text search box takes care of all that so our clients can find exactly what they want. We think it’s pretty cool, but then again, we're a little nerdy.